To say I am happy to be a part of this tour is beyond that. I have been a fan of McGuire's since her very first story and this new novel by her just proved to me all over again why that statement is true. Hold on to your hearts girls because this newest look into the Maddox boys, is going to try to steal it away. Darn those irresistible Maddox brothers. Just when I think I have a favorite McGuire pulls another wild card out and throws the game all off course and before I know it, I just want to grab them all and claim them as my own. If there is one thing McGuire is good at writing, it is a swoon worthy bad boy that defies all the odds. One that captures your heart whether you want him to or not, and will refuse to let go until they are buried so deeply inside, that you will never be the same again. I knew I was going to get a totally different story for Beautiful Disaster, but what I wasn't expecting were the events in this to coincide with the events in Beautiful Disaster. They travel side by side and it was so much fun to see. To get those little glimpses of Travis that we don't get to see in either Beautiful Disaster or Walking Disaster. Trent is every bit as wonderful as Travis but without the violet streak that Travis tended to show. In fact I think those that found Travis too alpha and dominating in BD will love this one because Trent, while having that protective streak that I think all the Maddox boys have, is far more easy going and more stable with his emotions. Those tender moments with Olive were enough to melt even the most callous of hearts. And Cami was every bit his match. I had nothing but love for the fierce independent girl that stole Trent's heart. If there is one thing you can say about the Maddox boys is that when they fall, they fall hard and it is always for someone who is completely worthy of it. There were so many surprises in this that it truly was a fabulous read. So many heart felt moments and pure raw honestly. I couldn't help but fall in love with it all. Like it's title, this was beautifully done and I loved every single minute of it. I can't wait to see which Maddox brother will be the focus of the next story. I was so sure it was a book part of a series that I didn't aks for it but I should have it sounds awesome. I ahven't read a book by the author but I'm curious to try. thanks for the review. This is a great series, I am sure you would like it Melliane! I adored this book, but I thought that characters would be a bit older and also set in different time frame, but this was great too. She writes the best book boyfriends! Glad I wasn't the only one expecting that, either way though, this was fab! I'm so happy you loved this one! I struggled with the first book in the series because I thought Travis' violent side was a bit too much for it and I was pretty much uncomfortable for most of the book. That being said, I think I would like Trent much more than I liked Travis from your description of him. Cami sounds like a lovely fierce MC too! Kim I am so glad you read and loved this too! I still have to read this series Ali!!! So many book series out there that I need to start, it's a bit overwhelming. I do so love a swoon-worthy bad boy, so I know these books will be right up my alley. Glad to know you loved it so much! Travis is a little tough to take in the beginning but I bet you would really like him and I just know you would love Trent! Well shoot. My comment just got eaten. Fail. Basically, I said I still need to read this series as swoon-worthy bad boys are right up my alley!!! So many book series I still need to start:) So glad you loved this Ali! I've heard about this series but haven't gotten around to reading it. It's definitely on my to read list! Happy to hear that Elieen! I do love a softer hero with a strong protective streak! I think I might be much more comfortable with Trent. :) I'm glad you enjoyed this as much as you did, and I really, really missed you too! I bet you love him Maja!! Squee! I bought this on release day and plan to read it this weekend. Course you won't see my review till September, but I am sure if you loved it I will too. I haven't really had an urge to read any of her books. I'm not sure why, maybe just cause it's NA? I'm not sure. I'm glad you really enjoyed though! NA can be a tough genre to read sometimes but this one is worth it! I love Jame McGuire so much and rushed out to buy this one when it came out but i was so surprised this one was set in the same time frame as Beautiful Disaster! I did love that though, since i also loved those special Travis scenes *starry eyes* LOL! I have been wanting to read this series forever and I don't know why I haven't gotten around to it. I really need to move it up. I have copies of the first two so no excuses. You do need to at least try one! I just read this and liked it. I didn't read Travis and Abby's book, but felt like I got enough of their drama from this book. lol. Yeah their drama was way more intense than this one was. Yeah it is a nice change of pace to see a more stable Maddox boy. Great review, and FABULOUS cover!!! It does have a fab cover! Great review! I loved this one to. I also liked that it coincided with Beautiful Disaster - and that ending totally took me by surprise. 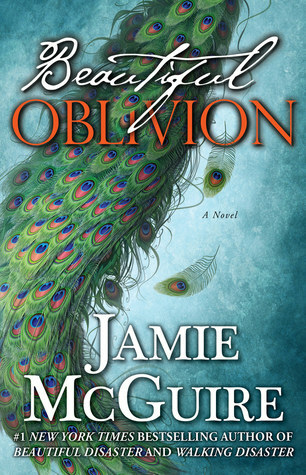 Can't wait to see what Jamie McGuire has in store for us next. GAH I can't wait to read this one! I loved Beautiful Disaster, I've probably read it three times since I first discovered it, and I can't wait to see waht happens with another of the Maddox men! You are going to love this then Jessica and especially all the inside looks into Travis we haven't seen before. Thanks Lauren and I really hope you do love it! I know that this is a new series (a spin off one I think) but I still haven't read the other books and I want to read them in order. Happy to see that this one had so many surprises and that you enjoyed it.